Jo-Ann Brant, currently an adjunct professor at Goshen College, has worked at GC as a professor and academic dean since 1993. She is also known for her unexpected friendship with a squirrel named Patch. They can often be seen sharing acorns on Patch’s stomping grounds, the grassy area between the Administration Building and Westlawn Dining Hall. Brant has a relationship with the woodland creature that would normally be held exclusively by Disney princesses. Patch always comes running at the sound of her voice, and the story of when they first met sounds very much like a fairytale. One day, about three years ago while Brant was leaving campus, a young, black squirrel came sprinting towards her. To Brant’s surprise, the animal sat at her feet and stared up at her. She decided to name the squirrel “Patch” because she had a small off-colored patch of fur on her right elbow. From that moment onward, Patch would interact with Brant each time that she saw her, and Brant’s reputation as the squirrel whisperer began. She says that Patch was always very brazen in terms of her behavior; she would sometimes climb into Brant’s jacket pocket while looking for nuts. Unfortunately, Patch once bit off more than she could chew when she wandered into the Westlawn Dining Hall. She had followed students into the dining hall but quickly realized that the noisy and crowded space no place for a squirrel. Brant explained that, after that day, Patch became more reserved. That became a habit after Patch attempted to follow Brant across College Avenue. Little did Patch know, Brant had run out of snacks. It was when Patch was pregnant that Brant realized that Patch was, indeed, female. Patch had three kits — or baby squirrels — last year. She had three more kits last spring, but they did not survive. Unfortunately, Brant witnessed Patch carry three dead kits out of her nest. Although Brant would love to once again own a pet, she is waiting until she has more time in her life to devote to an animal. And while Brant enjoys her relationship with Patch, she also understands that Patch isn’t a domesticated animal. She does not attempt to hold or pet Patch because she wants to protect herself from any diseases that Patch could be carrying. Brant also wants the students of Goshen College to know that they should not attempt to touch or even feed the squirrels on campus. On one occasion, Brant saw Patch carry an entire slice of pizza up the side of the Kulp fire escape and tuck it into the ivy before hopping back down the stairs. Brant knows it’s a ridiculous sight, but she said pizza is not something that squirrels should be eating. She has noticed some of the squirrels on campus have tumors or are very overweight. She worries about students, who probably have good intentions, that are unknowingly making the squirrels sick by feeding them human food. “Questions get raised about the ethics of human interaction with animals,” she said. 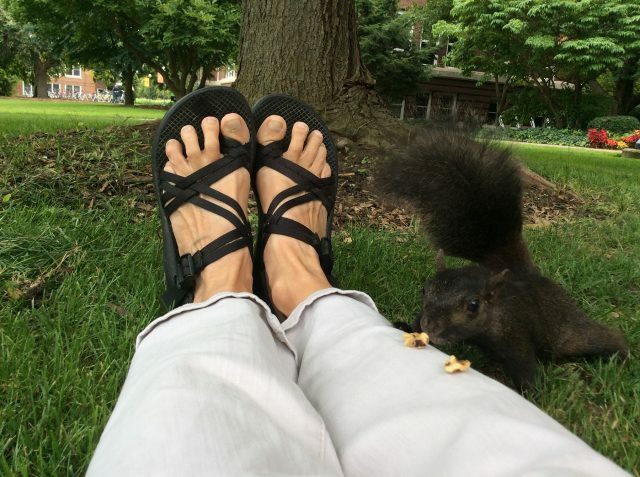 The traces GC community members leave on campus can directly impact the lives of other living creatures, such as squirrels. The decisions that Goshen College students make when considering how they interact with the campus wildlife determines the future health of GC’s unofficial mascot.